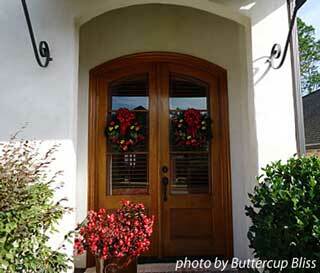 Need some Christmas decorating tips to help you decorate your front porch for the holidays? We sure have some for you! What better way to capture ideas for your own porch than seeing Christmas pictures of some fantastically decorated porches. 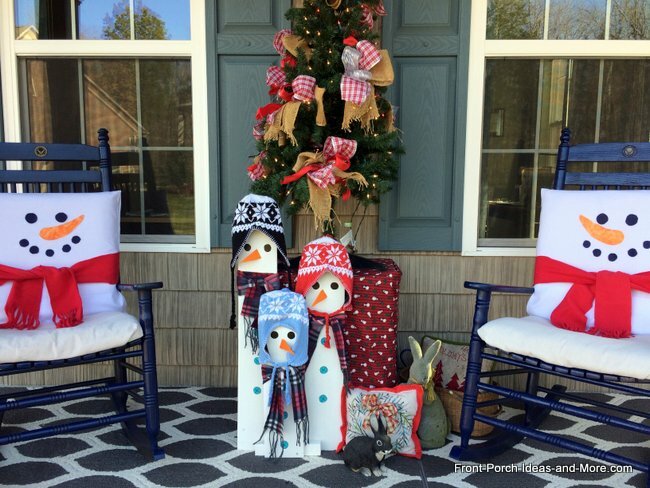 We've chosen some charming Christmas decorating ideas from creative bloggers who share their ideas for your front porch. We are grateful for their generosity in allowing us to feature them for you. Want a fun Christmas decorating tip? Scroll down just a bit to see our short video where we explain this DIY project even more. He, too, is made from a fence slat. 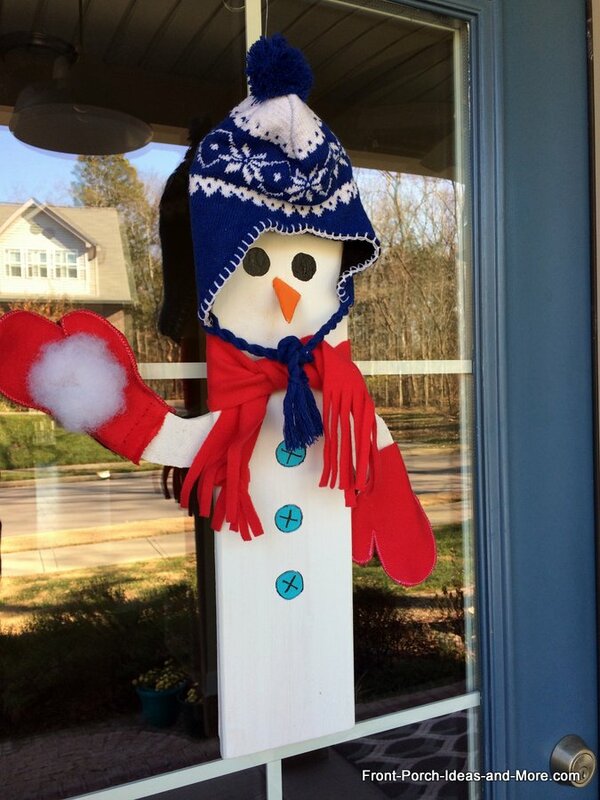 Less than $2 for one slat and you can make several snowmen from one slat. Just a little bit of paint and dollar store accessories. Truly an easy-on-the-budget kind of decoration. 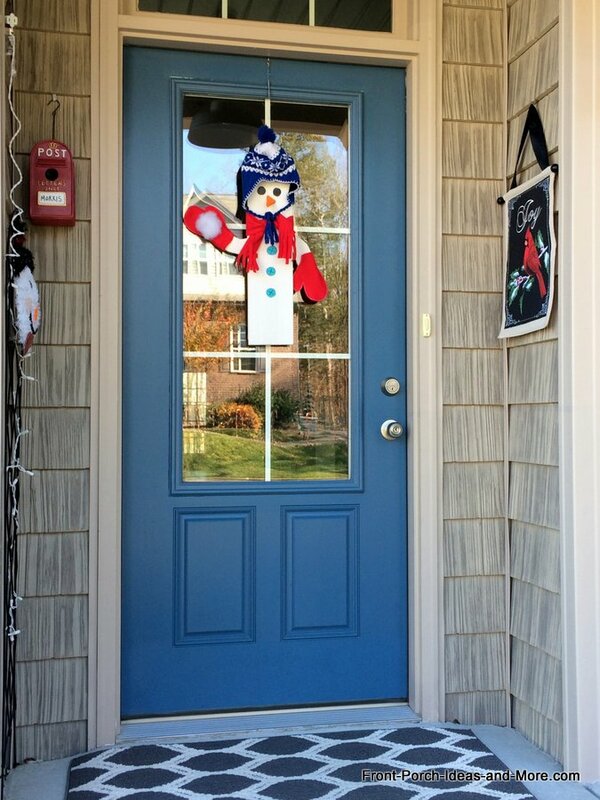 To keep the snowman from blowing in the wind, we have a suction cup with a ring on our glass door and an eye hook that connects to the suction cup. Works very well and the snowman hardly moves at all in the wind. Want to see more Christmas door decorations? 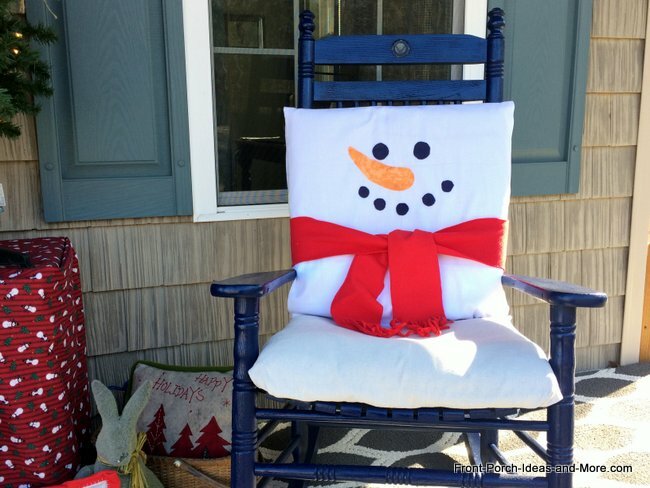 If your porch is too windy for decorations like these chair covers (ours are cushion covers), you could make them for indoors like at your dining table. That would be adorable for Christmas day, don't you think? The inspiration for these covers came from an idea on CollectionsEtc.com. Our video below this explains more. When the holidays were over, we took down the tree, but the snowmen will stay out for at least January and maybe even part of February. Then we like to decorate for Valentine's Day. 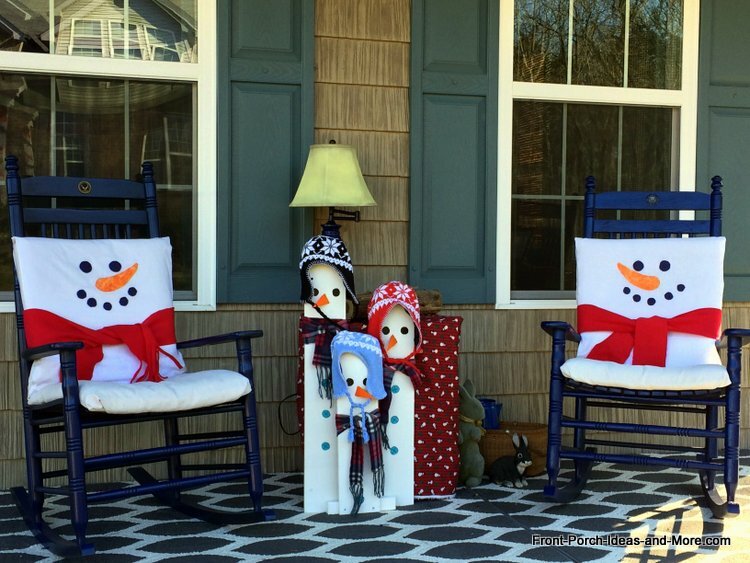 Want to see more winter decorating ideas for your porch? 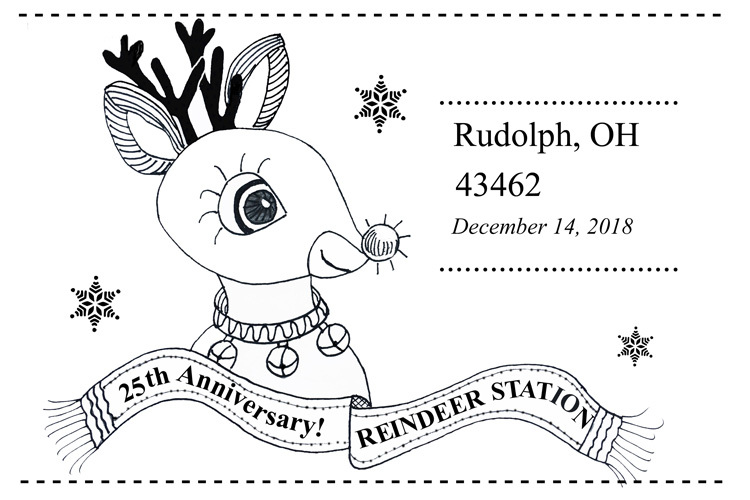 The tiny town of Rudolph, in northwest Ohio, has made its mark on the world by having a "Rudolph the Red-Nosed Reindeer" postmark since 1993. People from all over take or mail their Christmas cards to the Rudolph Post Office in December to have them manually postmarked with the Rudolph stamp. Their post office receives so many cards (we hear as many as 80,000) that Postmaster Charlotte Lamb enlists volunteers to come and help hand stamp each one with the Rudolph postmark. It's all done with love! The year 2018 is extra special because the Rudolph post office is celebrating the 25th anniversary of their Rudolph postmark. 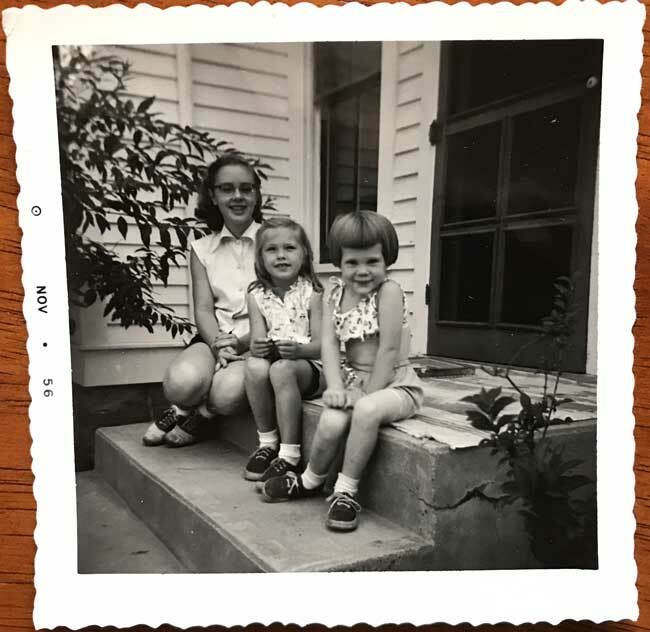 And because of that, Mary was asked by her dear childhood friend, Virginia Rudolph Swartz, to design a postmark that commemorates the 25th anniversary. Never did she think she would get to design a postmark, but it has become a reality! The anniversary postmark - that you see above - will be used only on two days, Friday December 14, 2018 and Monday December 17, 2018. The rest of the month the post office will use its regular Rudolph postmark (which is also quite cute!). 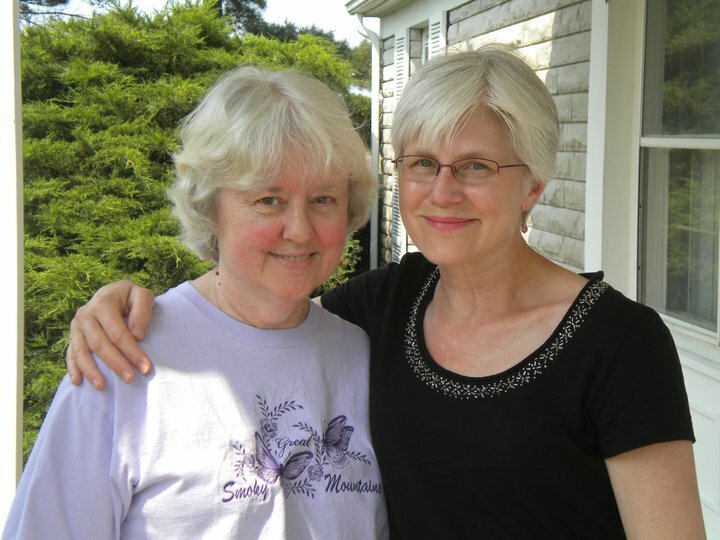 Mary's friend Virginia has a true connection to this small town and she is the one who gave her this opportunity. Her Great Uncle Henry Rudolph was the founder of Rudolph many years ago and his legacy lives on. Virginia's father, the nephew of Henry Rudolph, always dreamed of the Rudolph post office having a Rudolph postmark. While it didn't occur during his lifetime, it did take place shortly after he passed in 1993. Her father would be so proud to know that the small town of Rudolph has carried on this tradition for 25 years now. We are both so grateful for Virginia's ties to this small town and her persistence to spearhead the 25th anniversary postmark. And a photo from more recent years! We were blessed to visit Virginia at her Woodville, Ohio home a few years back. 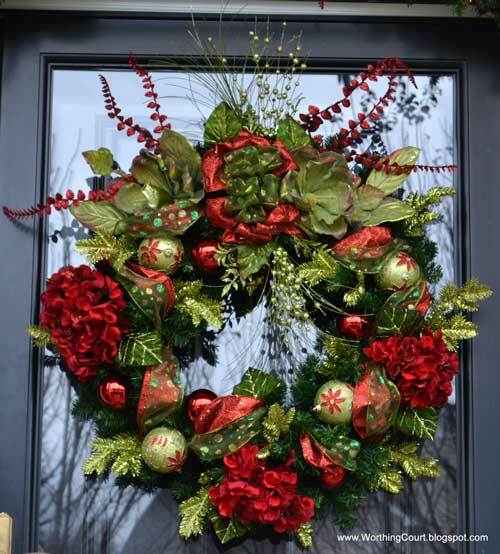 Suzy of Worthing Court has a most delightful wreath hanging on her front door. It is not only interesting but also has a glow that's most appealing. Notice how the shades of reds and greens make it bedazzle. 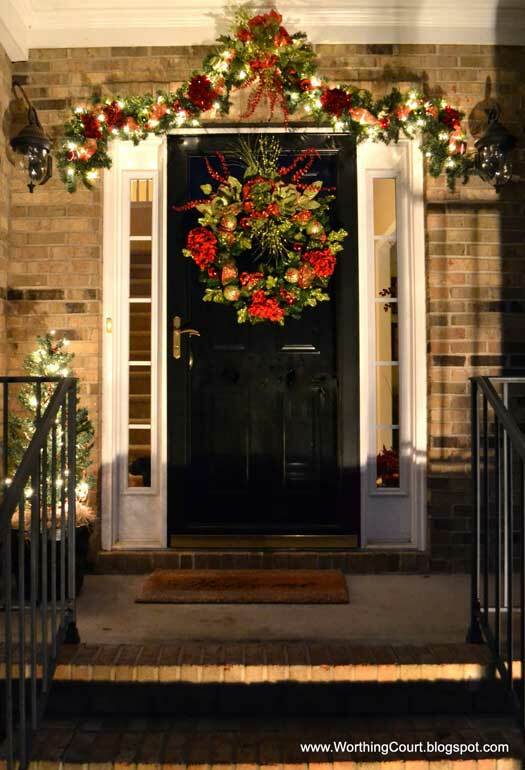 When choosing a wreath for your front door make sure it is large enough (but not too large) to make an impressive sight. Also make sure the colors complement the color of your porch and front door. Most impressive is Suzy's garland above the front door. Suzy began by wrapping three relatively inexpensive garlands together and then adding 200 lights. She added flowers, ribbons, and ornaments to fill in the garland to match the wreath. 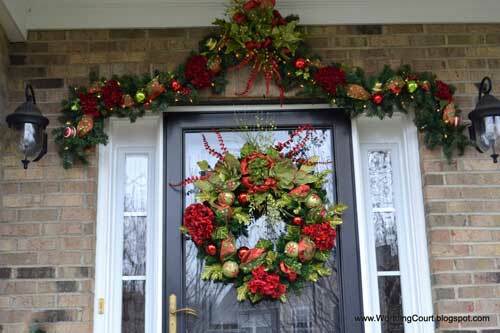 When creating the perfect garland start from the center and work toward the ends. Maintain symmetry by spacing objects equal distances from the center. If placing a bow in the center, weave the same ribbon throughout the garland. 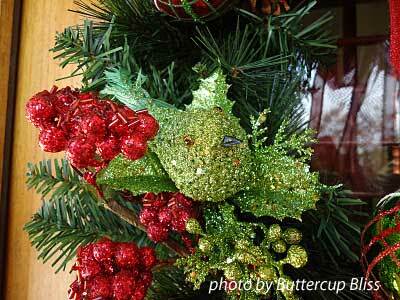 Add interesting objects like ornaments, twigs, or sprigs. 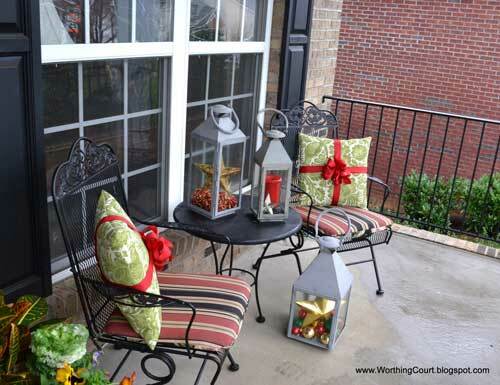 Simplicity makes an impact as seen by Suzy's decorated porch. The lanterns filled with holiday colors and objects along with the ribbon-tied outdoor pillows create plenty of curb appeal. 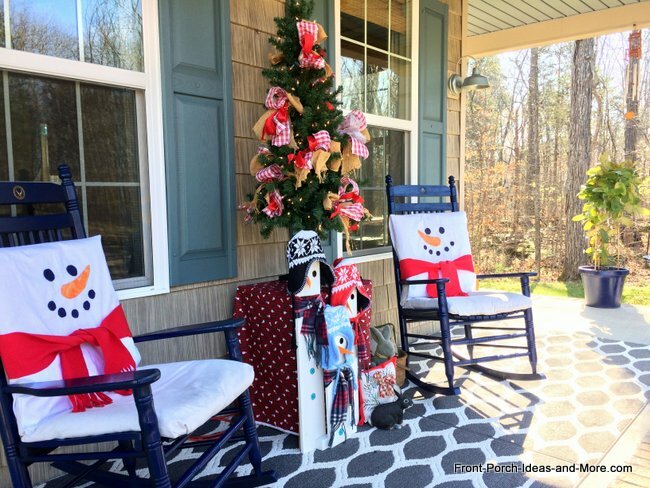 Adding colorful ribbons to pillows and outdoor furniture like porch swings is an easy and quick way to add holiday charm to any porch. Shari of Turnstyle Vogue has a beautiful wood front door along with several unique Christmas decorating tips that Mary and I really like! 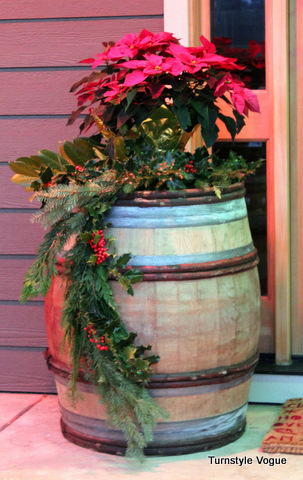 Transform a pickle barrel into a holiday planter. If your porch is large enough a barrel like this can hold poinsettias and other greenery. It adds an element of height to complement the front door and also reminds us of days gone by - just perfect for Christmas. 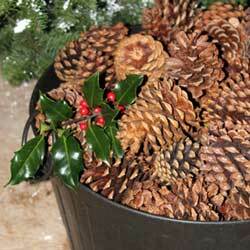 Mix a bucket of pine cones with holly or even ornaments to make a holiday porch decoration. To add a little sparkle, you can use spray glue to slightly coat the pine cones and sprinkle on silver or gold glitter. You can also add pine cones to floral arrangements (with or without glitter)! 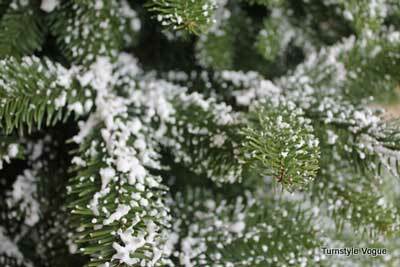 Of all the Christmas decorating tips here is one of our very favorites - snow dusting your tree. Shari has been doing this for many years and shows us how its done. She uses a box of Ivory soap and approximately one and one-half cups of water to create a mixture that borders on thin cake mix. Shari spreads a little at a time over the tops of the pine branches. 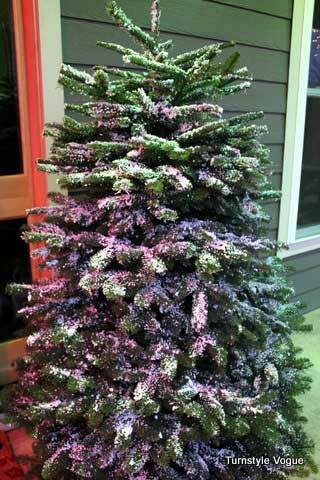 Shari recommends doing this for outdoor trees rather than indoor ones due to the smell. She also suggests using a drop cloth to catch the soap that doesn't stick to the branches during application. 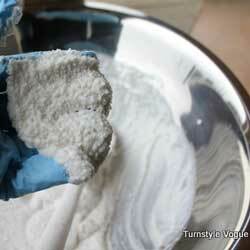 Be sure to see Shari's blog, Turnstyle Vogue, for more detailed instructions. Christmas decorating tips can be found in many ways. 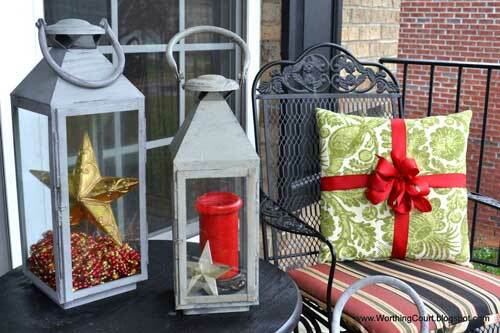 Carrie of Saving 4 Six displays one that works on any porch during the holidays. 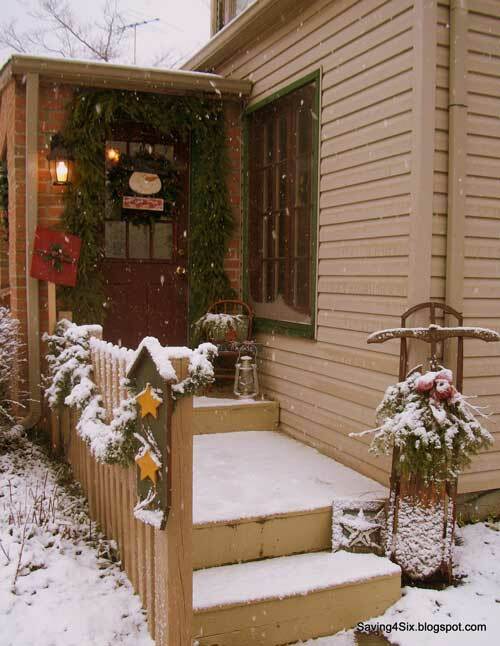 We selected Carrie's porch not only for its snowy appeal but also for personalizing her front door wreath. 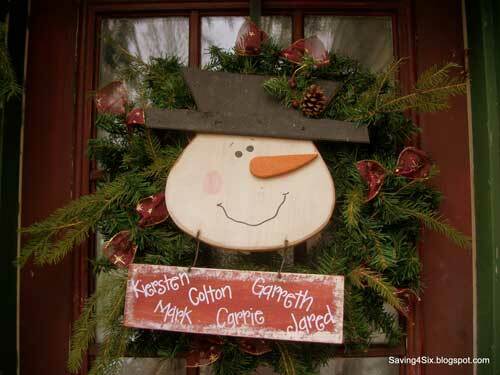 Personalizing holiday decorations, especially those on the front porch, with family member names adds warmth and charm. Carrie also gives us perfect insight into using everyday,inexpensive items to use for decorations. 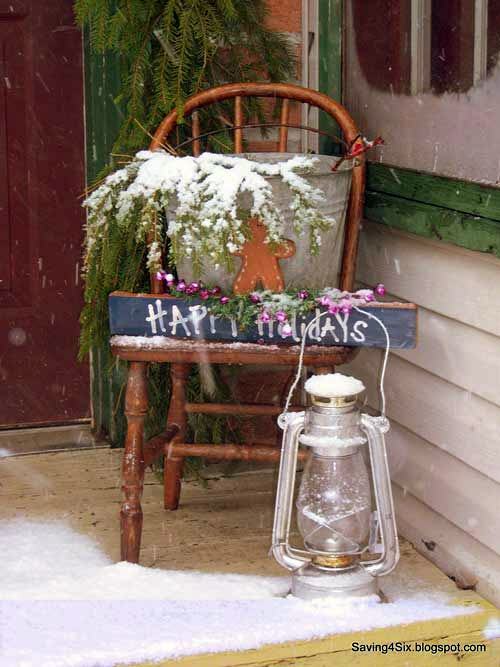 She purchased the chair and lantern for $5.00, filled a bucket with greenery, and used a sled in a most fun way. 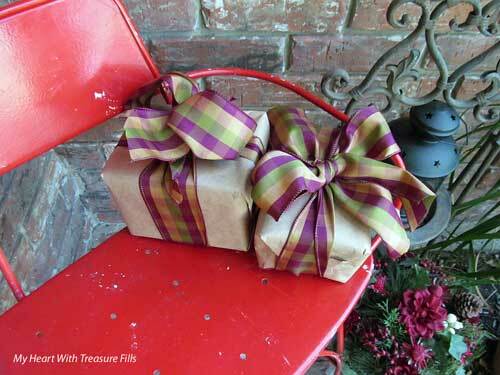 Lori of My Heart With Pleasure Fills caught our eye for two good Christmas decorating tips. 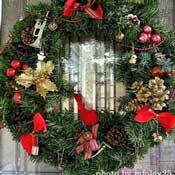 The first is her front door triple wreath. 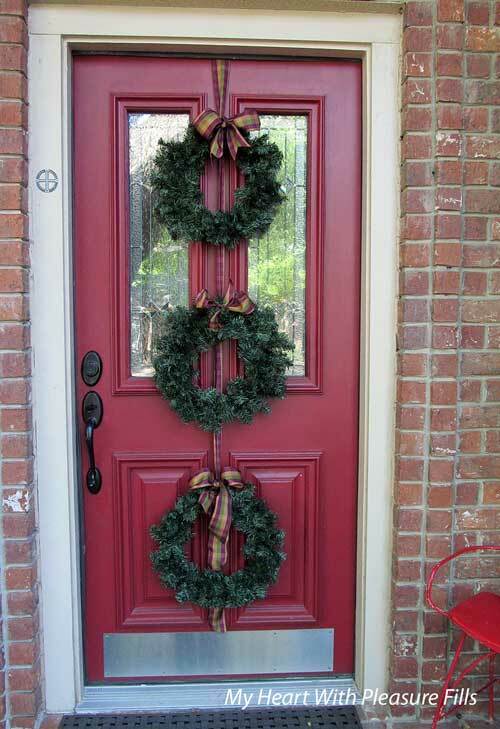 The wreaths add a new dimension and are ideal for a narrow doorway. 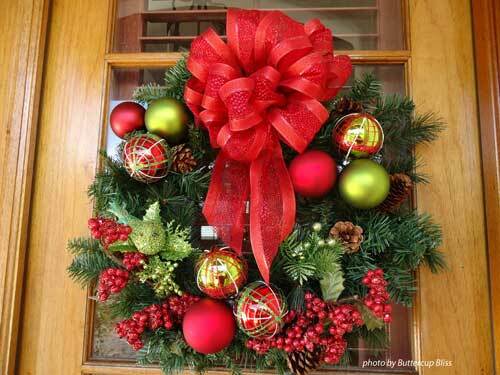 You could also add poinsettias, ornaments, or other decorative items to the wreaths. Packages! Imagine all of the fantastic colored wrapping paper you could use to decorate those old shoe boxes in your closet. Mix and match sizes, colors, and shapes to create a display or just use one or two like Lori did for a special look. Lisa of Buttercup Bliss forsake the store-bought wreaths and created her own masterpiece. Like many of us, she tried to reuse wreaths from previous years but they were no longer up to the task. Along with a friend, Lisa loaded a basket full of ornaments, stems, pine cones, ribbon, and wreaths. 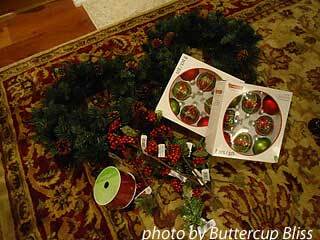 Once home, she spread them on the floor and began the fun task of assembling the wreaths for her front doors. Lisa incorporated her entire cache into the wreath down to this little lime-green bird! Lisa's tenacity and desire paid off handsomely as she now has two beautiful traditional-type wreaths to enjoy during the holidays. 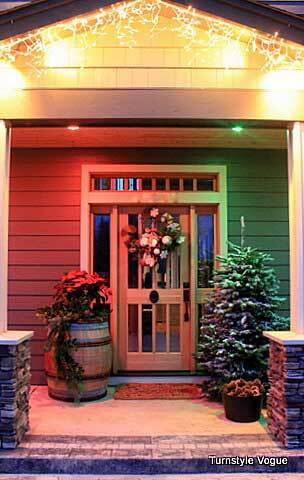 We hope our decorating tips and ideas will inspire you to decorate your front porch for Christmas. As you can see, it is easy, fun, and can be rather inexpensive too! See this fun Grinch Christmas porch for ideas you can use.